The Planet Uranus rules Aquarius and governs eleventh house matters. Astrologically this planet represents the turning of the tables - sudden changes for good or bad. Uranus rules Aquarius and governs eleventh house matters in your horoscope chart. The eleventh house is considered the doorway to hopes, wishes and plans for the future, as well as important social contacts. Uranus rules electricity, electronics, rockets, airplanes and pilots. Uranus governs modern technology -- inventors, scientists--pure science, eccentrics Uranus governs the radio-active, heavy metallic element Uranium. Uranus at Physiological Level rules the frontal lobe of the brain. In addition the planet Uranus is said to rule psychiatry and psychology. 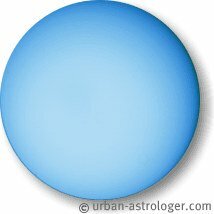 Uranus represents a specific kind of intellectual energy associated with genius. When it comes to locality astrology - also referred to as relocation astrology, the planet Uranus has very specific influences. The various parts of the world that reflect your Uranus destiny points can be looked at to understand that planet's emphasis on innovation discovery and insight in your life. Uranus is the planet of disruption, liberation, sudden changes. Revolution Technology. The changes are radical and cannot as a rule be reversed e.g. personal achievement, status in society -- public honour or notoriety; accidents; impersonal relationships. If you want to have a quick look where the planet Uranus will show in your chart you can check out our free horoscopes page which will give you a taste of astrology and how this planet works in your chart. If you want your customized in depth written computerized reports you can explore the different options available in our shop. Through the position of Uranus in your birth horoscope you can see where your individuality comes to the forefront and where you can choose to express the energy of Uranus. This forecast is all about your communications and connections. This forecast is all about your love and values. This forecast is all about your drive and ambition. This forecast is all about your career and lifepath and when it is best to make relative decisions. This forecast is all about your discipline and control. This forecast is all about your innovation and insight. This forecast is all about your imagination and spirtuality. This forecast is all about your personal transformation.